The BMW Art Cars will be on show in the UK for the first time from July 21 to August 4 at the NCP Car Park on Great Eastern Street, Shoreditch. The exhibition, Art Drive! 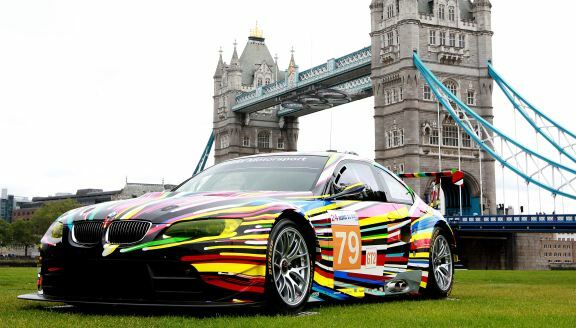 The BMW Art Car Collection, has been brought to the UK by the Institute of Contemporary Art (ICA), BMW, LOCOG, the Mayor of London and the London 2012 Festival. The collection was first initiated in the mid-1970s, with BMW cars handed to famous artists as “canvases”. Alexander Calder, Frank Stella, Roy Lichtenstein, Andy Warhol, Ernst Fuchs, Robert Rauschenberg, M. J. Nelson, Ken Done, Matazo Kayama, César Manrique, Jeff Koons (above), A. R, Penck, Esher Mahlangu, Sandro Chia, Jenny Holzer and David Hockney have created BMW Art Cars. The first was the brainchild of French racing driver, Hervé Poulain, who asked his friend Alexander Calder to work on a BMW racing car that eventually competed at the Le Mans 24-hour race in 1975. Sixteen artists are represented in the new exhibition over six floors of the car park, including Hockney, Rauschenberg, Koons, Warhol and Lichtenstein. The ICA has sought out help from emerging names including Julia, Loop.pH and My Beautiful City. A Flickr album to launch the UK exhibition can be found in ICA’s account; the entire collection can be viewed at www.bmw-artcartour.com. Admission is free.